I've been debating for quite a while, is that a picture/painting or a really nice public aquarium? you know, now that you say that, it looks really familiar. "Remember remember the fifth of November, the gun powder treason and plot, I know of no reason why the gun powder treason should ever be forgot"
My clam is in the bpottom corner of our 180.
the lighting is 1600 watts of 20k, metal halides. The clam has grown quite large since we aquired it from a x-reefer. So any one of these clams will survive in my tank? In this condition, will it be fine to place the clam up on the highest point of my live rock(that will be 3" right under the lighting)? I would not attempt to keep any Maxima or Crocea under that lighting chjy69, and a tank that is only 9" deep will not house one of the other larger, less lighting needy clams. Alright, well you didn't say your tank was only 9" deep, (typo). Honestly, one of the larger less lighting needy clams will quickly outgrow a 20 gallon, and quickly soak up nutrients such as calcium. If you really want to try it, get a 150 watt HQI, look into either a viper k2 clamp lamp, by JBJ. Or a pendant, such as the outerorbit with luner lights. How about a Current Nova T5? Could I keep a crocea 3" away from that successfully in a 20 gallon standard?? it should be fine. novas aren't single reflectors though but still put out more light than regular pcs. First question, is this a crocea? Its a 150 watt sunpod MH light. 20 gallon tank. I feed phyto once every 3 days. 1. Yes it is most likely a crocea. Tank looks relatively new. do you have a calcium / alk dosing regimen? tank is 5 1/2 months old, weekly water changes. Calcium and alk hasnt been a problem yet so i dont have a dosing regimen. 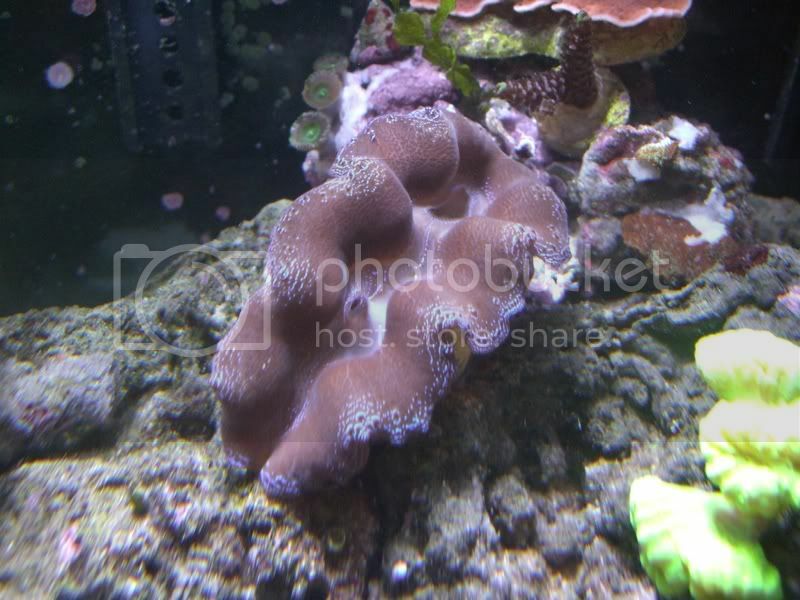 If you plan to add more stony corals and clams, you will need a dosing regimen for your nano. phyto is not necessary for the health of your clam. 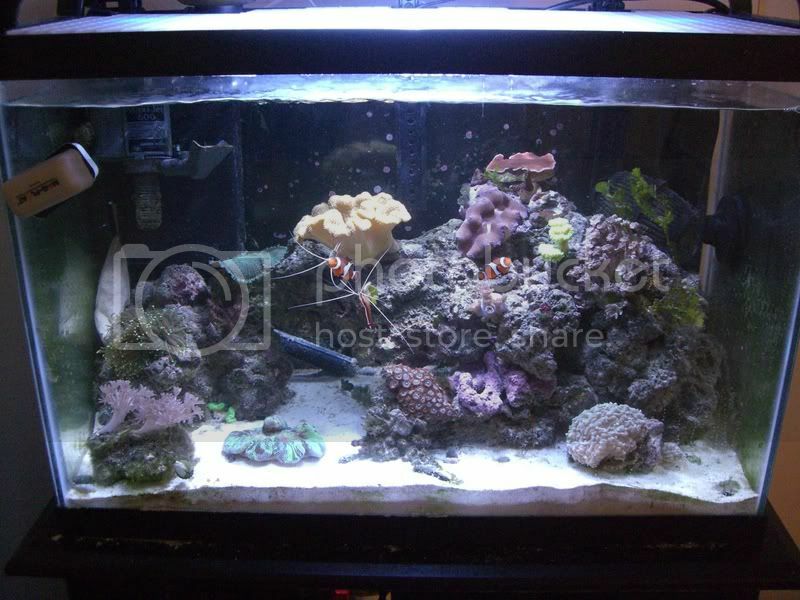 as long as you are feeding your corals/fish, it should get enough nutrients for its needs. Clams arent as picky as some people make them out to be. The rule of thumb was always "needs lots of light" because they are usually kept in tanks with halides, yes. But often, they are on the sand anyways, and years ago when that standpoint was developed, sure, it took alot of watts to get the light needed. Now we have better reflectors, more efficient bulbs (and in many bluer colors), and better ballasts. Yet we still think they need alot. Okay, so I have been doing PAR readings of clams for a while now in fellow reefers tanks. I found that a vast majority of maximas and croceas are in only 100-130 MicroMol/m2/s intensity light, and doing awesome. Can they take more? Of course. But do they need it?... no. Sure, they were kept in tanks with high-intensity, but that doesnt mean they are kept themselves in that high intensity light. They are often in the sand. Considering how crappy reflectors were 6-10 years ago in this hobby, I would imagine it would take alot of light to get that 100-130 down on the sand. Now though... its easy. T5s can easily do that. Back to PAR, these values are most important as they represent the "useable light"; however, not all organisms, and clams in particular, utilize the same PAR. This is due to the fact that their are many subtypes of zooxanthellae resulting in different light absorbtion spectra. Contrary to what would be thought, coloration (such as mantle color) has little to do with light spectra absorbed, as these only represent fluorescent proteins that have no part in photosynthesis. As I have found in my experiences and those of others, clams are unique, individual organisms that can be usually found within certain ranges of the reef habitat, yet that doesn't mean that's where they do best. Where clams are found in nature represents an area of toleration (within a wide range of growth) as far as lighting, nutrients, and current are concerned, but most importantly represents an area of low predation and hydrodynamic impact. To determine "YOUR" clams best closed habitat, one should experiment with position and types of lighting. Additionally, water purity and ionic stability is of vital importance to clam health. Even micro-levels of certain heavy metals (cadmium, copper, etc.) are strong "poisons" of cellular mitochondria in bivalves. This results is deceased aerobic efficiency and drastically compromised immune responses, making the clam susceptible to disease (perhaps involved in pinched mantle???). I would recommend only the use of RO/DI when keeping clams of any species, or genus for that matter. Secondly, I have found that ionic stability (particularly of Ca/Alk) are key to shell deposition and mantle expansion. The majority of clam systems that I have troubleshooted are growing poorly due to imbalance. What you say is very true for corals, but clams will pretty much adapt to whatever spectrum you throw at them. One question not answered is for how long should the halides be on daily over the clams? Regular Flourescents are on 12 hrs. the sun rises, stays, and falls for 12 hours in the equator of earth. if you want to replicate the exact amount of light they receive in tropical reefs near the equator 10-11 hours is around the norm. clams do exist in places much further from the equator also, such as the red sea and great barrier reef. they would probably shave of an hour or two of light. in our systems, i would say 10 hours is safe, with 9 hours being no danger as well. Can we go back to the sand/rock placement question? i read that crocea were rock borers. I was planning on putting a maxima in my sandbed, any particular reason i shouldn't? no reason, maximas will do alright on the sandbed. they do prefer to attach themselves when they are smaller though, so placing a rock under the sand wouldn't hurt. I have built my own LED lamp using shell from old flouresent fixture and a transformer from local electronics store. Took lot of research (esoterics abound).Very happy with results and so are my little buddies.